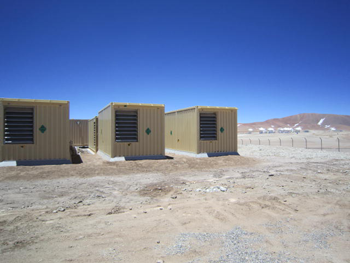 Composed of at least 66 high precision antennae, ALMA’s location is ideal as an observation centre, but poses particular challenges in terms of power supply and fluctuation due to its remoteness and extreme climactic variations ranging from +40°C in the day to -20°C at night. Whilst the gas turbines generate the power, it turned to Piller to ensure constant power provision, recognising its experience and expertise in challenging applications dealing with temperature changes, air density, dust, etc. Piller’s customised solution involves the installation of its UNIBLOCK UBT UPS system complete with four Piller Powerbridges to supply some of the power and reduce peaks resulting from load fluctuations. Daniel Bianconi, Piller Area Sales Manager, describes the system: “Located between the gas turbine and the load, the UBT UPS system ensures that all the peak currents caused by the load changes are smoothed by Piller Powerbridges, so the source sees an almost sinusoidal load current. “Giving the designer the chance to save space and maximise power density per unit, the Powerbridge absorbs energy at the same rate as it can dissipate it, meaning that frequency stability under dynamic load conditions cannot be matched by any other kinetic storage solution. With up to 16.5MWs energy stored in Piller’s Powerbridge the ride through time is almost double that of the alternatives. “The Piller UNIBLOCK UBT UPS system provides very simple maintenance and overhaul, with a MTBF of 1.38 million hours and fully redundant control electronics and robust power semi-conductors ensuring the highest system reliability as a whole”. Piller is a world leader in power protection technology, building systems for "mission critical" applications world wide. The company was founded in Osterode, near Hanover in Germany in 1909 by Anton Piller and acquired by the British engineering group Langley Holdings PLC (www.langleyholdings.com) in 2004. Today, the company is still headquartered in Osterode and employs approx. 750 people worldwide.